The ECOWAS Community Court of Justice dismissed a preliminary objection filed by the Federal Government of Nigeria challenging the jurisdiction of the court to hear a case of breach of fundamental human rights filed by Nnamdi Kanu.. In a ruling on Tuesday in Abuja, presiding judge, Micah Wright, held that the court had jurisdiction to entertain the application. Mr. Wright ruled that the case was admissible. The judge then adjourned till April 27 for continuation of hearing. 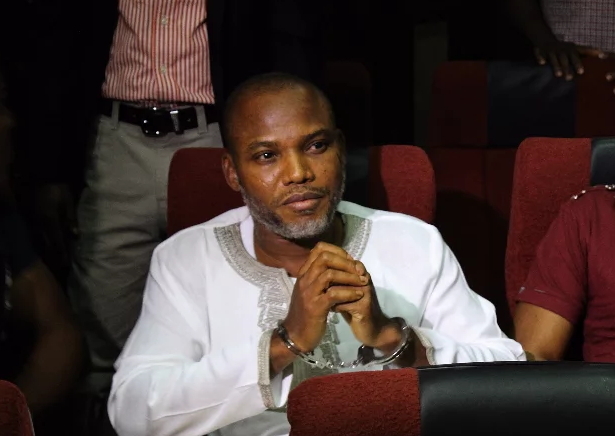 Mr. Kanu, the Director of Radio Biafra and Leader of Indigenous People of Biafra (IPOB),is suing the Federal Government for his prolonged detention. Joined in the suit are the Attorney-General of the Federation and Minister of Justice and the Director-General of State Security Services (DSS). Mr. Kanu, in the suit, is seeking $800 million compensation for violation of his human rights and an order directing his unconditional release and that of his personal belongings. He is also praying the court to direct the defendants to respect, protect and promote his rights to life, liberty and freedom of movement, assembly and expression. Mr. Kanu is also praying the court to declare that his arrest and detention since Oct. 14, 2015 by the defendants, is in flagrant disobedience to several orders of courts of competent jurisdiction. He is also praying the court to declare that his continued detention is a violation of the African Charter on Human and Peoples’ Rights, the Universal Declaration of Human Rights, the United Nations Charter of 1970. Mr. Kanu was arrested on October 18, 2015 and subsequently detained by the SSS in Abuja. He was , however, granted bail on October 19, 2015 but was not released and has been in detention since. On November 18, 2015 ,the Magistrate Court I , sitting in Abuja, ordered the SSS to produce Mr. Kanu, at the court on Nov. 23, 2015.